troubleshooting of stand-alone and hybrid power supply systems for off-grid applications. The culmination of the training saw the Deputy Somaliland Representative to Kenya, Ayanle Salad Dirie and the Deputy Vice Chancellor, Research and Innovation, Strathmore University, Prof. Izael Da Silva, address the trainees and hand over the certificates of completion to them. 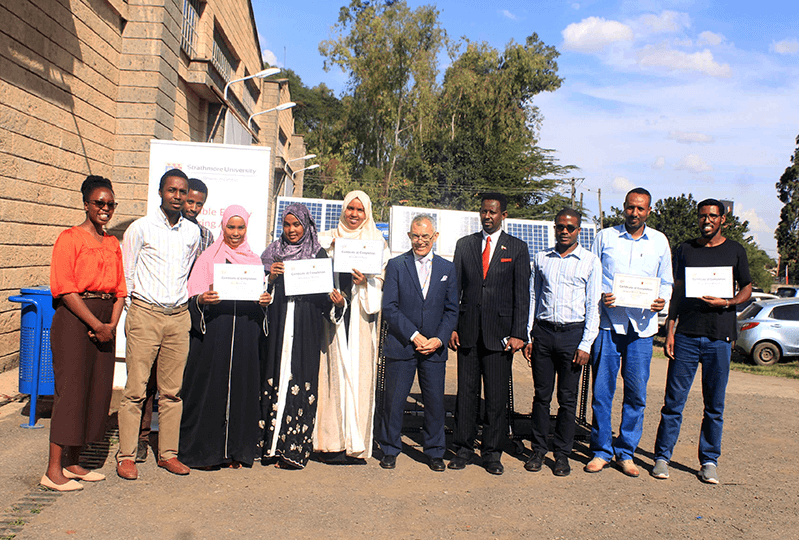 The Deputy Ambassador thanked Strathmore University through the Energy Research Center for building the capacity of their engineers citing that electricity is a major challenge in Somaliland. He also encouraged a stronger partnership for training more participants in the energy sector as there is a clear gap for skill development is Somaliland. Prof. Da Silva encouraged the trainees to disseminate the knowledge when they go back home so as to add value to their society. The training was funded by the USAID under the Growth, Enterprise, Employment and Livelihoods (GEEL) program, which mainly focuses on the agricultural sector, fisheries and renewable energy.